Do you want a way to develop your professional and personal life? Would you like to meet more like-minded individuals? A networking group could be the answer. If you can’t find the perfect one to join, why not consider organising your own? Organising a networking event can be a great platform to promote both you and your business while helping others along the way. 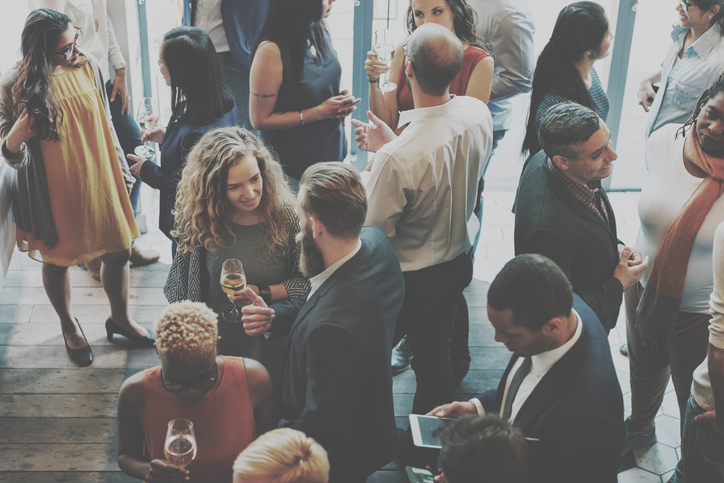 Follow these 8 steps to organise a successful networking event and just see what doors it will open and what exciting opportunities it will bring your way. The best networking groups are ones with a niche area of focus. Perhaps you want to create a group for people working in your specific industry or a network for entrepreneurs or small business owners? Or maybe you simply want to provide the opportunity for people new to the area to make friends? Networking can be as structured or as casual as you want, you just need to decide what will work best for your audience. If the individuals are already familiar with one another, for example, getting together in the pub for a couple of beers might be sufficient to generate good chat, but others may need more encouragement to mix and mingle. You could think about speed networking, where every participant gets to make a short, two minute introduction to the other. For a small group, you could organise an intimate sit down meal or, for larger numbers, a scenario where diners swap tables between courses. You could facilitate networking around an activity, such as a cooking class or hike. It could also take the form of a professional workshop or talk, giving participants an extra incentive to attend. Even if you’re not running your networking event to turn a profit, you’ll probably need to spend some money to provide a venue and refreshments. Once you know what you want to offer at your event, you will be able to price it up. Then you must decide if you will seek to generate the money through ticket sales, self-fund from your company’s marketing budget, or seek outside sponsorship. Allowing businesses to exhibit at your event or make a short presentation is a good way to raise funds, but try to ensure they are relevant to your audience. Don’t be afraid to charge a reasonable cost for attendance; putting a value on your event will lead others to regard it more highly. Selling tickets also enables you to get a handle on numbers and reduces no-shows. If you’re on a small budget, it’s tempting to seek a free or low cost venue such as a community hall or room in a pub, but it’s worth bearing in mind the pulling power an interesting venue can have. Giving people the opportunity to visit somewhere unusual or more exciting can have a big impact on sign-up. Try to barter with venue managers by promoting the benefits of having your networking group along and by offering the opportunity for them to get involved. Once your networking group is more established, you can also look at the possibility of hosting events at your members’ own business premises – everyone loves a look behind-the-scenes! It’s impossible to pick and time and day to suit everyone, but think about your demographic and what might work best for them. For example, if you’re targeting professionals who are extremely busy, it might make sense to plan a breakfast event so it doesn’t impinge on their working day. On the other hand, younger people might not be willing to get up early and might prefer a drink in the evening. Don’t forget to take into consideration people’s childcare commitments – an event planned in the half term holidays might be difficult for parents. In terms of days, something midweek is normally best – before people start thinking about the weekend. When thinking about start and finish times, think about where your attendees will be coming from and give them enough time to make their journeys. Don’t keep them out too late on a school night either! You can help people discover your event – and seamlessly manage registrations – by setting up an event page on Eventbrite. As well as having its own event listing search engine used by thousands of potential attendees every day, Eventbrite integrates with Facebook to help you promote your event on social media. It’s easy to create a low-cost, highly targeted, Facebook advertising campaign to raise awareness among your intended audience. Don’t forget to also make use of LinkedIn, professional groups and forums, and industry press and websites to promote your networking event as widely as possible (ticketing through Eventbrite can make sure you don’t become over-subscribed). Invite anyone specific you’d like to attend with a personalised invitation. The most important aspect of your networking event is that people actually network, so make it your priority to personally meet and greet every attendee. Get to know something about them and help identify others who might be useful for them to meet. You can get a head start on this by utilising Eventbrite’s Custom Questions feature, enabling you to request any extra information you’d like at the point of registration. Find out each attendee’s job title, who they work for and what their interests are. Once you have this information, you can send round a list of attendees prior to the event, helping guests identify in advance anyone they’d particularly like to meet. You could also consider using a networking app that helps people to connect before, during and after your event. Maintain the momentum of the face-to-face networking and discussion by taking it online. Make sure you have a LinkedIn or Facebook group set up which members of your networking group can join. Developing an online community and providing another opportunity for attendees to touch base lets them build their relationships. As the event host, be sure to contact everyone who attended to say you enjoyed meeting them and would welcome any ideas for improving the event next time. Do this by phone for key contacts and make use of Eventbrite’s integration with SurveyMonkey for formal post-event surveys. Through helping others make meaningful connections you can boost your own career and business. As the host of a networking event, you enjoy the privilege of being able to build a relationship with each and every attendee, meaning your contact book will soon be bulging!